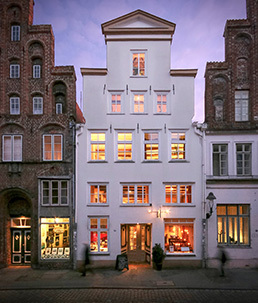 For your stay in Lübeck our charming boutique hotel is the ideal starting point for sightseeing and shopping. The central location of the house, which is built in 1304, in the middle of Lübeck´s historical old-town is perfect for you to regard all the monuments by walking. Our seven large and comfortable rooms are individually furnished and have the latest equipment. They have a nice, little coffee and tea-kitchen. The holstein breakfast is fresh prepared and will be served in the historical hall.